What did the Kabbalists of the past prepare for us? They built the system that connects all of the broken souls with the Light of Infinity. They joined their corrected souls with a net that is reminiscent of a fishnet. Through it, they pass the Light on to us, lowering it to our level. 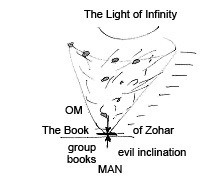 If, by reading The Zohar, we attune ourselves to the reception of the Light of Infinity, it descends upon us. If not for the Kabbalists of the past generations, this net of Light we can connect to, would not exist. There would be only simple abstract Upper Light. However, the Kabbalists performed the corrections by creating the web of connections among their souls. This way, they built the entire system of weakening and adapting the Lights, as well as passing them down toward us, degree after the degree, generation after generation. This makes the Light fit for our souls.